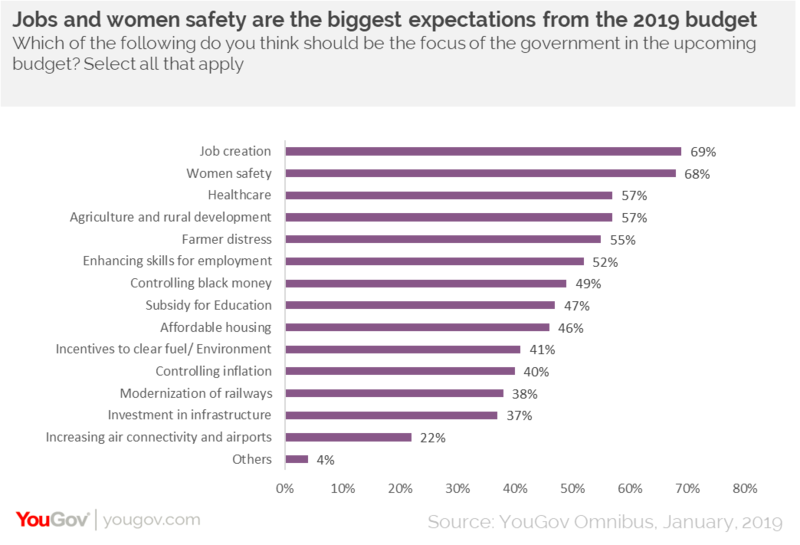 on January 29, 2019, 11:27 a.m.
On being questioned about what the focus for the upcoming budget should be, job creation and women safety emerged as the top areas people believe the government should pay attention to in 2019. Interestingly, a higher number of women consider these issues a priority than men. While women safety is the most important to those aged above 30, job creation is paramount for those under 30 and those belonging to tier-1 cities. Notably, controlling inflation is also important to 47% of respondents who are 30+ and 43% men consider investment in infrastructure a priority. Income support and tax measures are likely to be a highlight of this budget with the expected inclusion of some tax sops. With regard to these policies, removing taxes on medical expenses, universal basic income support for farmers and increasing income tax exemption to INR 5 lacs are the most favoured propositions by the respondents. Interestingly, around 3 in 5 respondents aged above 30 strongly favour increasing tax exemption to INR 5 lacs than those under 30. 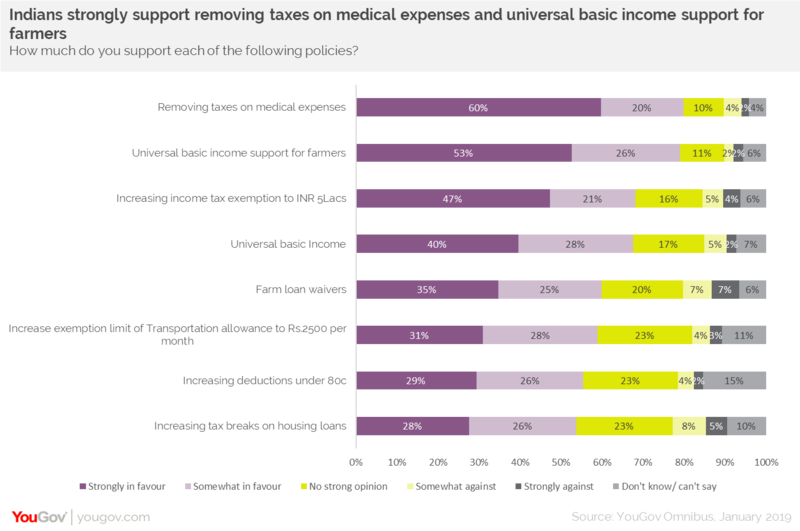 Comparatively, there is lesser support for increasing deduction on 80c and increasing tax break on housing loans. In the past few years, the government introduced several policy reforms that had an impact on citizens. Generally speaking, people seem to have had a more positive than negative impact of the policy reforms initiated in the recent years. Comparatively, reforms such as digitisation (74%) and aadhar update (67%) were more positively received by people than GST (55%) and demonetisation (50%). Interestingly, GST and demonetisation had a stronger positive impact on men than women (35% vs 26% and 27% vs 21% respectively). As the state grapples with fiscal deficit, increasing tax on liquor comes in as a solution for the government. As per our data, increasing taxes on “sin goods” such as cigarettes (78%) and alcohol (74%) is favoured more by people than raising corporate tax on large businesses (58%) or increasing GST for real estate (34%). Lastly, speaking about their financial lives, most people are likely to invest in fixed deposits (43%) and mutual funds (42%) in 2019. This seems to be the strongest in tier-1 cities. 37% women intend to invest in gold, while a higher number of men plan to invest their money in SIPs, stock markets and NPS as compared to women. It is also interesting to note that a higher number of people aged above 30 are inclined towards investing in insurance (health, life, etc), SIPs and NPS compared to those under 30. This budget is crucial for both the government and the people of India. Whether it meets people’s expectations or not, we will have to wait and see on February 1. Data collected online by YouGov Omnibus among 1,020 respondents in India between 22nd and 25th January, 2019 using YouGov’s panel of an online representation of India.